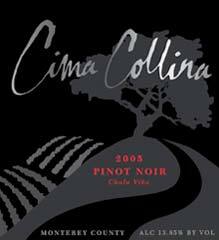 Founded in 2004, Cima Collina produces artisan wines from small Monterey vineyards. Three acres owned (Hilltop Ranch Estate Vineyard), 20 acres leased or controlled (Chula Vina Vineyard, Lucia Highlands Vineyard). The Hilltop Ranch Estate vineyard is situated on a south-facing slope just east of Carmel Valley Village. Mostly planted to Pinot Noir with a little Pinot Gris, it is farmed organically. The soils are rocky and calcerous and the wines struggle to grow resulting in low yields. Annette Hoff Danzer is the winemaker (pictured) and general manager who has shown a nice touch with Pinot Noir. Annette originally set out to be a veterinarian, but while at UC Davis, she became intrigued with wine and decided to pursue a career crafting wine. Shed served winemaking stints at Sterling Vineyards, Saintsbury, Estancia. New Zealand. 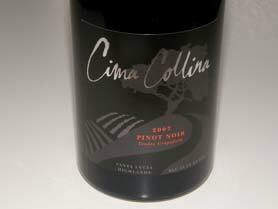 Her first love is Pinot Noir and released the first Cima Collina Pinot Noir in 2005. The Pinot Noir lineup: Hilltop Ranch, Chula Vina, Tondre's Grapefield (Santa Lucia Highlands), a favorite of mine, Hilltop Estate, Chalone, and and a Monterey County appellation blend. Production of 4,000 cases also includes Chardonnay, Sauvignon Blanc and Cabernet blends. A tasting room is located in Carmel-by-the-Sea on San Carlos between Ocean and 7th and is open Thursday through Monday from 11:00 to 6:00.